Fashion is everywhere. It’s on the billboards as you drive to work, the advert sidebars on the websites you visit, and on the front of magazines on supermarket shelves up and down the country. But we’re not just talking about adult fashion. Kids’ fashion brand, Lamaloli, knows what kids want – and that’s the latest branded clothing with images and characters from all their favourite films. And who better to show off these great garments than the kids they’ve been designed for? Lamaloli uses child models in photo shoots to display products across their website. Fun, fresh, and aimed at kids, it makes total sense that the products are shown to their very best on the people they’ve been made for. Social media is a big deal when it comes to fashion. A down moment at work, an advert break in our favourite soap, a little peek while we’re waiting for the train – it’s easy to get online and see what’s happening in the world of fashion. 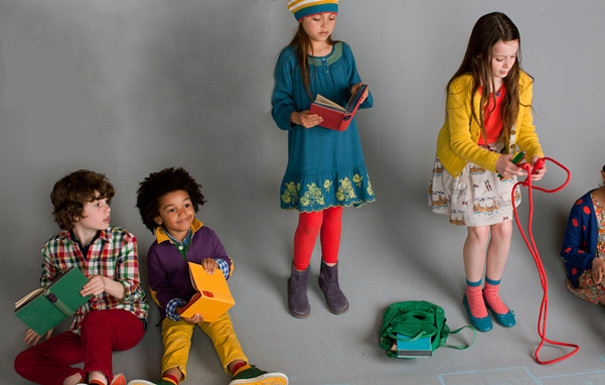 For a seriously eclectic collection of kids’ fashion, Babyccino Kids hits the spot. This online store is a great place for independent labels – largely making outfits from natural and organic fabrics. Kids are everywhere here – from the Facebook page with just under 20K likes to the Twitter page full of links and info on the gorgeous kiddy-friendly fashion they stock. The summer holidays can seem like a long old slog to anyone with kids, but Boden raised even the most miserable of parents out of that end-of-holiday slump with their fab YouTube ‘TrueView Advert’. It used a bunch of kids to show off the best of their back to school range, plus loads of kid-friendly outfits designed for getting out and about in. The colours of the clothes, the fresh faces of the kids, and the fun of the advert all worked to show off the product to its best. Top end labels also appreciate the value of using children to show off their kids’ clothing ranges. Take Burberry’s Christmas advert for instance. Featuring Romeo Beckham in a classic trench coat and Burberry scarf, what parent or fashion-loving boy wouldn’t want to emulate the very same look of quintessential Britishness? High street brand, H&M, features a cast of kids in its latest TV advert showcasing the best of its Autumn 2015 fashion range. It’s simple, easy to follow, and shows a number of different outfits and accessories. Appealing both to fashion-conscious kids and cash-strapped parents, it serves as a neat reminder that H&M offers trendy, affordable, and fun kids clothing. All of these brands have used children to promote their product. While some use kids to appeal to parents’ desires to dress their children in adorable outfits (Babyccino Kids), others use kids to appeal to kids themselves (Mini Boden, H&M).